In the light of the government’s failure to continue to protect so many vulnerable and valuable stretches of our coastline by using the machinations of the Shoreline Management Plan (that placed Hemsby into the ‘Managed Retreat’ category, i.e. do nothing) local people have organised the setting up of ‘Save Hemsby Coastline. See our 14th May website Local News item ‘Local people plan DIY coastal defences for Hemsby, Norfolk’. 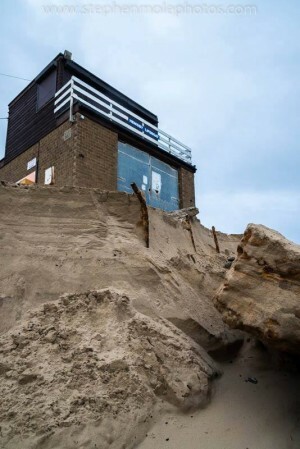 Since then a further two metres of sand has been stripped from the beach and the dune front cut back by a further four metres, destroying the rebuilt lifeboat ramp, threatening its shops, businesses and tourist facilities, and about to take at least eleven more bungalows. Hemsby is a highly popular resort visited by many thousands each Summer, who put in £80m each year to the local economy. It further provides employment for hundreds of people. Like most coastal resorts, Hemsby is dependent on its beach and the facilities provided. But the loss the beach, the shops, the beach restaurant and coastal housing and accommodation would prove to be economically as well as aesthetically crippling. Dune destruction at Hemsby Beach and the threat the lifeboat house following the most recent storm, when a further 4 metres of frontage was lost. 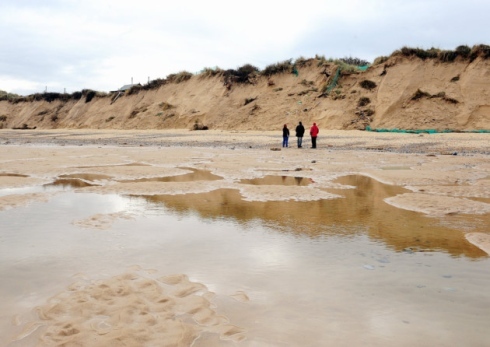 A fully protective defence system to protect the entire dune front from further erosion would cost £8m, this deemed ‘economically unaffordable’ by the pundits who have withheld proper recognition. So Lorna Bevan Thompson and the local people, aided by residents, regular holiday visitors, traders, businesses and supported by the public have all come together to form the 1,252 people strong and growing ‘Save Hemsby Coastline’ group, which is making great strides to raise the funding required to curb the continuing and escalating erosion. Many of these have contributed £50 each to purchase a 2 cubic metre block to place in an initial interlocked line of blocks along the dune base of a 200 metre stretch of the stricken coastline to test the viability. Great Yarmouth Borough have promised £15,000 to do more if the initial pilot scheme proves functional and viable. Hemsby Parish Council will similarly contribute £15,000. With this additional income it should enable protection of a 1.5 Km stretch of the dunes. The landowner Geoffrey Watling Ltd. has promised £10,250 made from the ground rent of endangered properties plus labour costs, whilst over £18,000 has been raised by the remarkable efforts of the organiser(s) and active members of the ”Save Hemsby Coastline’ group.This sum has been acquired by rattling buckets, running raffles, bingo evenings, tombola, quizzes, party evenings, selling sloganised T-shirts and mugs and by organising a series of firework displays, parties, cake stalls, and other activities. The first dune base alignment commenced 19th October, with the next step being to purchase, transport and bed in 180 2 cubic metre blocks costing £23,389 over the next few weeks. This will just about exhaust the currently available funds.